It is interesting to read about the origin of the classic hummus. Or hummous. (Or hummus b’ tahina or hummus b’ tahini!) It appears that there is no great clarity on this. Except of course that every East Mediterranean country seems to claim it as its own. There have even been (peaceful, thankfully!) Hummus Wars, as discussed in this article in BBC Travel. 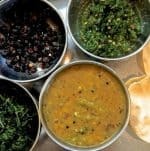 The dish is now popular along the Levant and is almost a staple food in Lebanon and Israel. 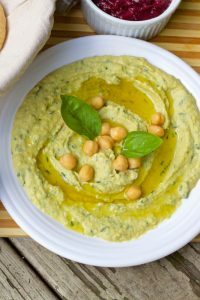 There are many many versions of the hummus, and I had to navigate through them to develop the recipe for my perfect hummus. 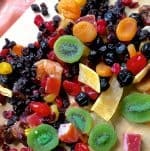 Making the no fuss hummus from scratch may seem like hard work as my recipe shows several steps. However it isn’t difficult, as most processes such as soaking the chickpeas overnight and boiling them next day, don’t require you to be standing and monitoring. Finally it comes down to tossing everything into the food processor, and blending it into the oh so tasty hummus. As you would know if you follow my blog, I am, like a million other foodies, a staunch, unabashed Yotam Ottolenghi fan. The recipe for the no fuss hummus from scratch, follows his methods and process, though not in all aspects. YO’s hummus recipes have baking soda added both while soaking the chickpeas and while boiling them. Instead I add baking soda only while soaking the chickpeas. ( I drain and rinse the soaked chickpeas thoroughly, before putting them to boil.) The volume of tahini he gives in his recipes, has also been drastically reduced, in mine. Two recipes of YO’s that I followed to a large extent, are Ottolenghi and Sami Tamimi’s Basic Hummus, published in Epicurious and the Hummus with Ful recipe in Plenty and in the Guardian. 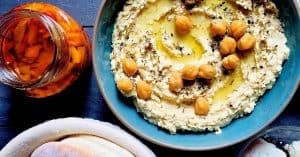 One article I enjoyed while reading up about making hummus, and which you may like too, is again from the Guardian, a lovely, light-hearted and yet serious approach to making The Perfect Hummus. Making Hummus? Don’t Throw Away That Chickpea Water! On a totally different note, I have been reading and hearing about aquafaba recently. Here is an article which I found to be lucid and helpful in making and using aquafaba. This is nothing but the water left over after boiling chickpeas, and is used as a substitute for eggs in vegan recipes. I need to explore it further in vegan and gluten free baking. 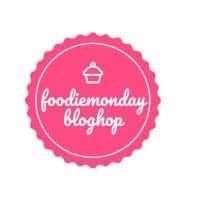 The theme for the 181st event of Foodie Monday Blog Hop is Levantine Cuisine, suggested by me and voted for by the majority of members. I’m looking forward to reading the lovely posts my fellow food bloggers are going to come up with, on Monday. No Fuss Hummus From Scratch. 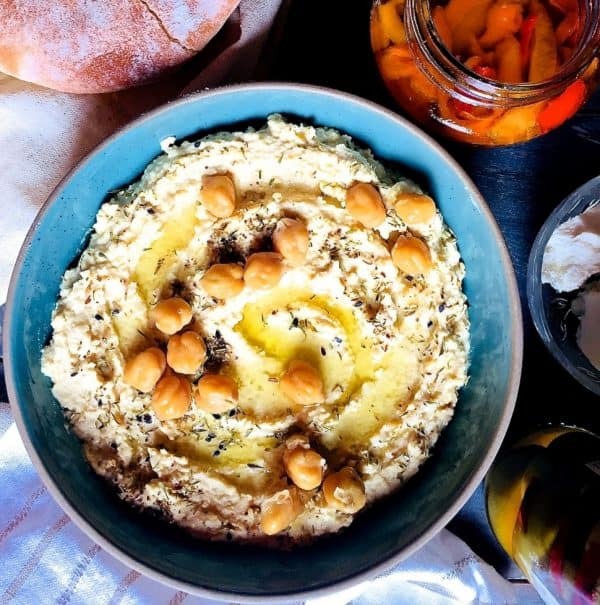 Delicious Levantine Dip of chickpea blended with tahini and lemon. Detailed notes to guide you through every step of the process for a simple, classic Hummus. Soak the chickpeas overnight ( or at least 10 hours) in cold water after adding the baking soda. The water should be at least double the volume of chickpeas, and should be about 2" above the surface of the chickpeas. After the required soaking time, drain and thoroughly rinse the chickpeas, discarding the water in which they were soaked. Add the drained soaked rinsed chickpeas to a medium sized pan, sufficient to hold the chickpeas. Add double the volume of water than the chickpeas. During the boiling and cooking process, make sure there is adequate water to cover the surface of the peas. Bring to a boil and then reduce the heat to allow the chickpeas to simmer. Cook until done, ie till the chickpeas are well cooked and begin to fall apart, breaking when you press one between your fingers, but not getting mushy. Mine generally take about 90 minutes, as it depends on the chickpeas as well as the heat from the stove. Pressure cooking is of course much faster, and I cook it for 2 whistles and allow the steam to dissipate on its own before opening the cooker. You need to use less water though, while pressure cooking and I don't often use this process as the chickpeas may get overcooked and mushy. Allow the chickpeas to cool in the cooking water (after you have removed them from the heat) If you wish, you may stir the pot and remove the chickpea skin you see floating around after a good stir. I don't bother, but removing the skin is said to give a silkier hummus with better colour and flavour. Once cooled, drain the chickpeas but reserve the water in which they were cooked. (Refer post above to read more about aquafaba or water in which chickpeas are cooked). Also reserve about 2 tablespoons of chickpeas for garnish. While the chickpeas are boiling, as above, assemble all the ingredients. Crush the garlic and squeeze the lemon for lemon juice. All of them including the chickpeas, should best be at room temperature before you start making the hummus. If you are using water instead of aquafaba for processing the hummus, keep ice cold water handy for the next step. In a small bowl, add the tahini and about half of the lemon juice. Add the crushed garlic and stir it all in well. As the mixture tightens, add a little of the cooled liquid from boiling the chickpeas, and stir till you get a fluid paste. Add the drained boiled chickpeas to the food processor. Add the tahini garlic paste. Blend till chickpeas are well processed into a puree. Add a little salt (about 1/2 teaspoon). Add the liquid from the chickpeas (or ice cold water, if using) little by little, running the processor as you go, till you get the right consistency - not yet runny, not stiff either, just a soft paste which can 'hold its shape' as Yotam Ottolenghi's recipe in the Guardian says. Taste the hummus, adding more salt (go slow though, and don't over salt it! ), garlic or lemon juice. Transfer to a serving bowl and cover with cling wrap so that the wrap touches the surface of the hummus throughout, leaving no space for air to enter. Place in the fridge for at least 30 minutes, for it to set. Serve at room temperature. Alternatively, serve the hummus warm, with a spread of olive oil on top. If serving at room temperature: Garnish with the reserved chickpeas, cracked black pepper and za'atar and a drizzle of olive oil. Serve with Pita Bread and olives. Hummus may be served with various toppings such as ful (dried fava bean paste), fried chopped lamb (kawarma) etc. Thank you Sasmita! 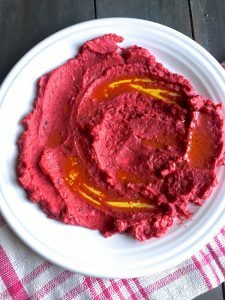 I realised that Ive been posting recipes for hummus of different types, and not the basic one! The Levantine cuisine theme seemed appropriate! My all time favorite dip as its so versatile. 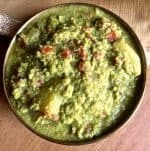 One can enjoy it with veggies, pita bread, crackers etc. I’ve even had them with sliced apples and on salads. I feel sad that I had to miss this lovely theme. You are so right, Mayuri. The hummus is so flexible, you can have it with most food. And it makes everything even more delicious! this photo is a showstopper, Sujata 🙂 and loved the classic version and the various read (links) sprinkled throughout the post.. I could dig into this on a warm / chilly day with some pita and a book by my side… bliss !! 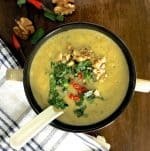 thanks for a wonderful theme, I enjoyed reading all the posts / recipes.. Thank you, Kalyani. Researching for a post throws up so much interesting information! It does slow down the post drafting, but its so much fun too! Just like you i enjoyed reading The Perfect Hummus and so true this is so comforting. I do make a version every week in a small tub and feels particularly useful on the day I have run out of all the ideas. Great images here. Thank you, Seema. Hummus is my goto dip, and I also make a batch every week! Love the hummus n the way you have explained it. The whole picture is so beautiful. Lovely share. Thank you so much, Archana. Hummus is my go to comfort food on weekends! The Hummus looks absolutely stunning and yes, I am a major Ottolenghi fan too. Classic Recipes, simple ingredients and his signature style and emphasis on flavours. Uff! 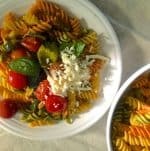 A great recipe with tips. Thank you Vidya, and so happy to hear that you and I have a love for YO’s recipes, among other similar tastes! Loved your well explained recipe. My daughter loves hummus. Saving it to try when she come home. Awesome share. Thank you Sujata Roy! Hope both she and you like this version! Thank you, Priya. 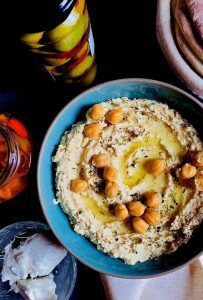 The hummus is the quintessential Levantine dish, and yes, its a great place to start understanding this cuisine. Your hummus looks really very comforting and flavorful di ! Beautiful Photography ! I enjoyed working on this fantastic theme di. Thank you Poonam! I saw the picture of a plate of hummus on a magazine cover a couple of years ago – an US magazine though I don’t recollect the name. Its stuck in my mind ever since, and Ive been using it for hummus styling.